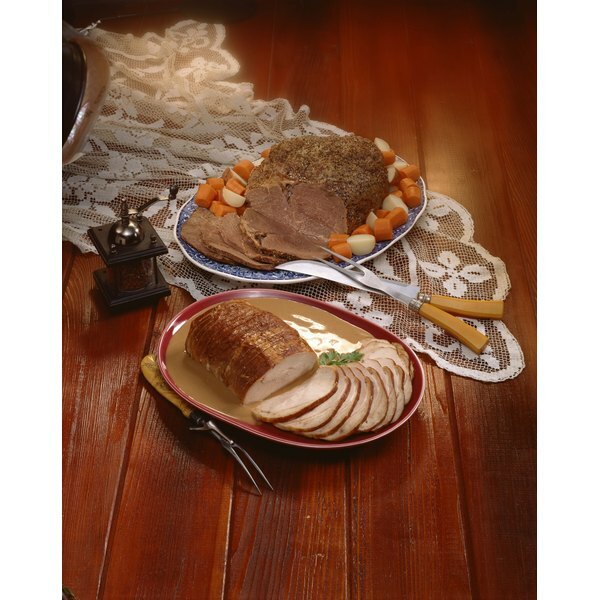 Allow a roast to sit before carving to preserve moistness. Cooking meat over higher temperatures tends to make the outside of the cut drier and overcooked while the middle is just up to a safe temperature. Slow cooking meat over a low temperature yields a tender, moist cut when done properly. The key to slow roasting your meat in the oven is time and temperature. Once you get those to things down pat you will be able to pull this technique off effortlessly. Preheat your oven to 200 degrees. Place your meat on the rack inside your roasting pan and place the roasting pan on the center oven rack as soon as the oven is done preheating. Check the internal temperature on your meat regularly with a meat thermometer. Continue to cook it until the thickest center portion of your meat reads an internal temperature of 110 degrees. Depending on the size of your cut of meat, this should take between six and eight hours. Raise the temperature on your oven to 500 degrees. Allow the meat to cook for an additional 10 to 15 minutes. Check the internal temperature again. Beef, lamb, duck and veal should be 145 degrees before you remove it from the oven. Pork should be 160 degrees and turkey, or chicken should be 165. If it has not reached that safe temperature, allow it to continue cooking, checking the temperature every five minutes until it is done. Allow the meat to rest for 20 to 30 minutes before serving. This will enable the juices to settle into the meat so they don't run out when you carve it.